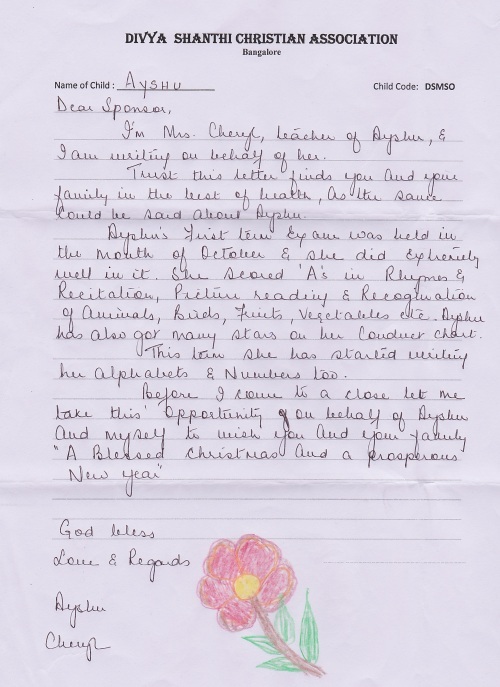 Just a couple of days after opening this year’s sale, I got a lovely letter from Mrs. Cheryl, one of the wonderful teachers at Divya Shanthi in Bangalore, India. She wrote to update me on Ayshu’s progres (Ayshu is the four-year old girl who Aliventures’ readers sponsor through this sale). Ayshu’s first term exam was held in the month of October, and she did extremely well in it. She scored ‘A’s in Rhymes & Recitation, Picture Reading and Recognition of Animals, Birds, Fruits, Vegetables etc. Ayshu has also got many stars on her Conduct chart. This term she has started writing her alphabets and numbers too. I’m so thrilled to hear how well Ayshu is doing; education really is the way out of poverty for the kids at Divya Shanthi, and it sounds like she’s getting a wonderful start. Get Your Blogger’s Guide(s) … Time’s Running Out! All the money raised through this sale will go to Divya Shanthi in Bangalore, India; half will be for Ayshu’s sponsorship, and half for a new fund for students going into further education. You can find out more about Divya Shanthi and the Blogger’s Guides (and buy the Guides!) in last week’s post. Did I misunderstand something, or do these kids have tests in preschool / kindergarten? It breaks my heart whenever I come across children who are ill at ease in their environment. That, of course, carries negative connotations, such as poverty, unemployment, lack of caring and affection, etc. Hence, I would like to thank you for your charitable contributions, but hope there are many more people like you. Our world has problems galore, so we all need to pitch in to make our world a better place. It is no fun when only a few of us are privileged over others, who “lead lives of quiet desperation.” Cheers.